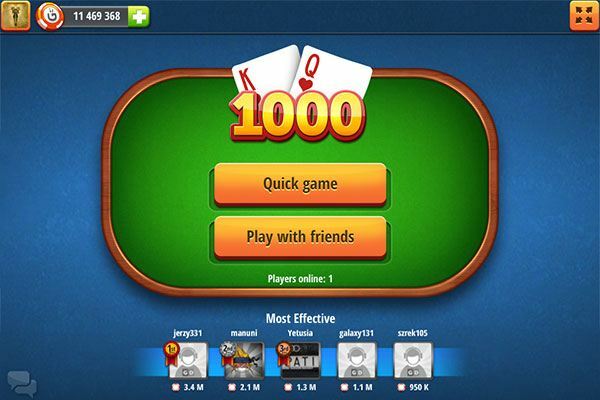 1000 is one of the most popular Polish card games and it is well-known throughout other eastern European countries, such as: Russia, Belarus, Ukraine, Kazachstan, and Lithuania. The game is based on another game called Mariage, which is the French word for marriage. It refers to pairs consisting of two cards (Queen & King) of the same suit. One of the cool things about the game Mariage is that it's referenced in the Polish national epic poem Sir Thaddeus. 1000 is a game for two or three people. The most crucial skills for the players are being able to remember cards and being good in thinking strategically. The game is played with one small deck of cards and throughout the game the trump suit changes. There are a total of 24 cards. The main point of the game is to get 1000 points as soon as possible - hence, the name of the game. Points are gained by melding marriages (melds) and by collecting tricks. 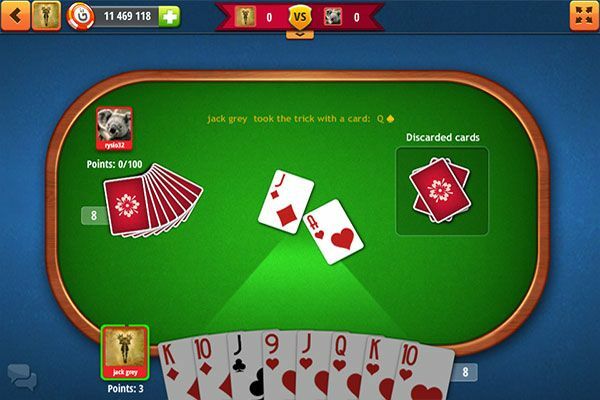 When 2 players is playing, each player receives 10 cards to start. The remaining 4 cards form two kittys, with 2 cards in each. When there are 3 players, each player reveives 7 cards and the remaining 3 cards form the kitty. Next, there is a round of bidding. 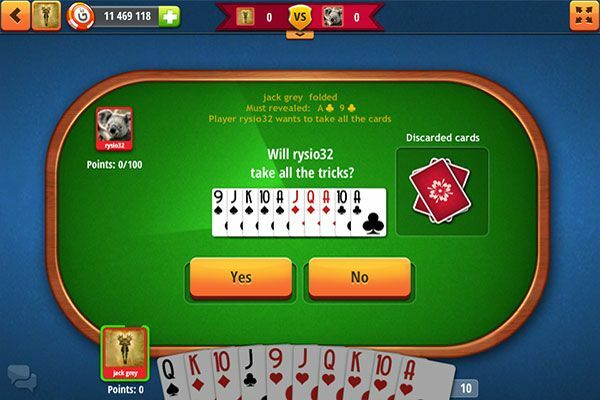 The player who wins the bid starts the hand by laying of the first card. Then, the other players add cards to the card played by the first player. The trick is taken by the highest card. After dealing, players bid. The bidding is always started with 100 by the player to the left of the dealer. The next player has two options, he/she can either fold (which means not bidding higher than 100), or make a higher bid. Players can raise the bid by increments of 10. When a player bids, he/she declares how many points he/she will take that deal. The bidding cannot go higher than 120 (which is the sum of all cards in the game), unless the player has a pair. In this case, the player can bid to 120 (the sum of all cards), plus, the amount of the player's melds. If a player wins the bid, he/she must to take the amount of points declared during the bidding (or more) to gain positive points. Otherwise, he/she receives negative points. When there are 2 players, it is possible to get up to 360 points. With 3 players, it is possible to get up to 300 points. The kitty is the cards which have not been dealt to the players. They are placed face-down on the table. The winner of the bid has the right to take it. When there are 2 players, the winner of the bid takes one of the kittys (2 cards each). He/she then takes two cards from his/her hand and puts them face-down on the table to replace those taken. Both kittys remain face-down until the end of the hand. With 3 players, the winner of the bid takes the 3-card kitty. After that, the kitty is turned over and shown to the other players. However, there is an exception - if no one bids, the first player has to bid 100 and only he/she sees the kitty. Next, the player who took the kitty, has to give two cards to the other players and everybody then has 8 cards. Whenever a marriage is melded, from then on, that suit is trump during the game. The trump suit cards are higher than the other cards, even cards that are technically higher in other suits. The trump can be changed by melding another marriage – which means there is then a new trump suit. The 1000 gameplay consists of many deals. The scenario of a deal looks like this: deal → bid → take the kitty → meld cards and collect tricks. The first card played of a round dictates that all the cards played next must follow suit. If the player doesn't have that suit, he/she must use trump. If a player doesn't have any trump, he/she can play any card. When there are 3 players, each player can use a bomb once. 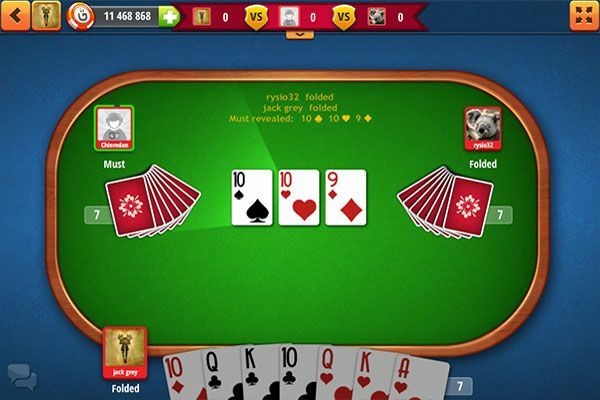 It can be used when two players fold and one player is forced to bid 100. If the player decides to use a bomb, the game doesn't start. The player doesn't get negative or positive points. The other two players get 60 points each. For every trick taken and for every marriage melded, a player receive points. The player, who won the bid, must get at least as many points as he/she declared (otherwise, he/she will have negative points). The other two players can get only positive points in the round. The situation changes when one of the players has 800 points. In that case, the player can only get positive points if he/she wins the bid. Marriages (pairs)are declared automatically by discarding The Queen or The King. When there are 2 players, whoever took the last trick gets points for the cards in the kittys. Points are added up after each deal and are rounded up to a multiple of 5.